Buckeye Valley’s Jack Rotondo (8) works against Pleasant’s Nick Kimmel during the second half of Monday’s MOAC showdown in Delaware. 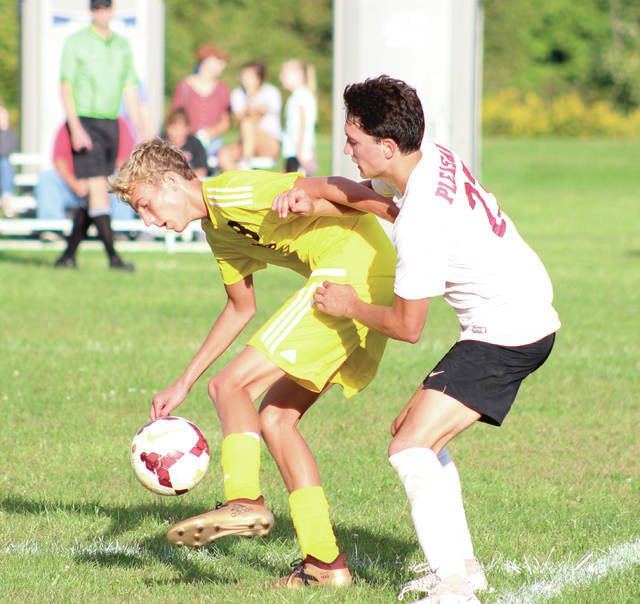 For more than 65 minutes, the Buckeye Valley boys soccer team was destined to quietly take home an MOAC victory over rival Marion Pleasant. But, the Spartans put the pressure on in the final 15 minutes forcing BV goalkeeper Jack Scheeler to make a couple game-saving stops, including one in the final 15 seconds, to allow the host Barons to escape with a 2-1 victory Monday night in Delaware. Pleasant’s Drew Decker sent a corner kick in from the left side to the opposite side where Nick Kimmel headed it back toward the middle forcing Scheeler to leave his feet to prevent the game-tying goal with about 15 seconds remaining. Scheeler said Kimmel tipped his hand enough for him to make an educated guess on where the shot was going. BV coach Eric Staley pointed out that Scheeler has grown a lot in a short amount of time. “It was a little bit of luck, but I feel like a lot of training went into that,” Scheeler said. Scheeler’s other key stop came on a Gage Williams header off a Decker corner in the 69th minute. He had three saves in total in the second half in relief of Cole Davis, who didn’t record a save in one half of action for the Barons (5-3-1, 3-1). Decker almost tied it in the 68th minute, but his shot from the left hit the top-right corner of the goal post and caromed out. The Barons held the lead from the very beginning thanks to a Felipe Scharff goal off a Ben Daily feed out of the opening kick 41 seconds into the game. A.J. Nicolosi rebounded and scored a Daniel Patrones shot initially saved by Pleasant goalkeeper Gavin Baisden with 16:37 left in the first half to up the lead to 2-0. Logan Cauthen lofted a shot from deep on the right and in to get the Spartans on the board with 7:41 remaining in the opening half. Baisden finished with 12 saves for the Spartans (2-5-2, 2-1-1). Next up, the Barons are off until Monday when they travel to Johnstown-Monroe in non-league action. Kickoff is scheduled for 7 p.m.